Are you as ready for Spring weather as I am? We have had a couple warm-ish days that have left me (and my budding daffodils) craving sunshine. With Spring fast approaching, I am anticipating those bright days when you can enjoy being outside all day and long into the evening. If you have followed the blog for the last 6 months or so, you may remember that we have plans to build a deck off the back of our house for dining, lounging and, especially, entertaining. We cannot wait to be able to enjoy our backyard even more this year! An outdoor living space should be an extension of the living space inside our home - cozy and comfortable. 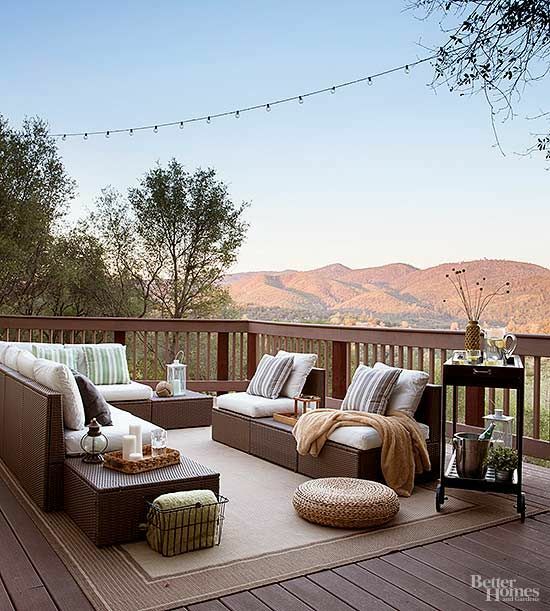 As we finalize the plans for the deck and work through the timing of when we begin the construction (we need to finish our master bathroom remodel first), I have found some beautiful inspiration photos of outdoor living spaces that will work into our own design. I love that these are all real homes. Sometimes, it is easy to look through inspiration photos on Pinterest and design blogs only to become discouraged that "my home will never look like that." That's because staging a home for a professional photo is not the same as taking a photo of the home that you actually live in. The inspiration here is totally attainable and realistic to DIY. In addition to comfortable seating for dining, lounging (or this) and intimate conversation, here are a few elements that I love in a outdoor living space - you can use the arrows to the left and right to advance through the photos if you need to! 1. Art (yes, even outside) - I like to find old, chunky frames at the thriftstore to repurpose with vintage art or digital downloads. 3. 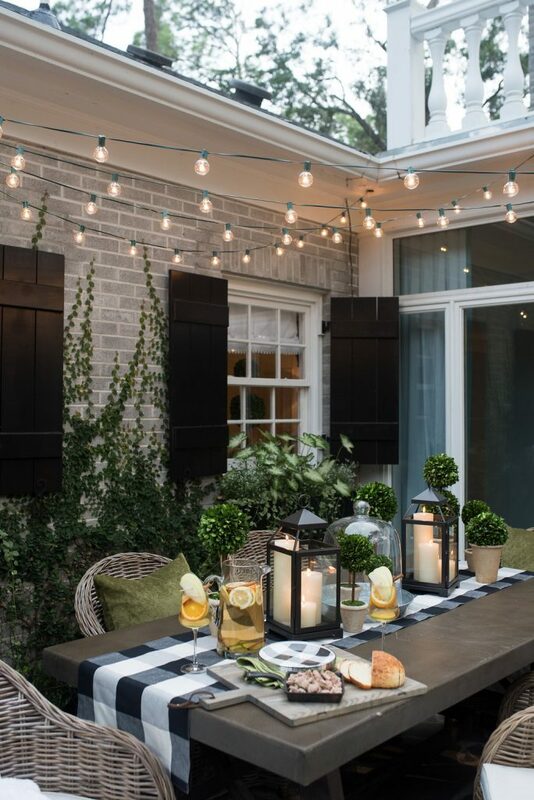 String lights and candles - Adds a lovely soft ambience any evening gathering outside. 4. Outdoor Area Rug - Softens a stone, brick, or concrete patio (or wooden deck) and helps visually demarcate a dining space from a lounging space. Word to the wise: pick an outdoor rug that can be hosed off and that won't show dirt easily. 6. Potted plants and flowers - Potted herbs are my favorite! Not only are they practical for cooking with, but they look pretty in pots. Rosemary and basil are two of my favorites and are usually very happy in pots. Mint, however, does not like to grow in a pot. It needs room to spread out (it is pretty invasive so make sure you have the space for your mint to grow like crazy). Get outside and enjoy some fresh air! Have some friends over for a relaxing evening in your outdoor living space.